Earlier this year, Facebook announced a plan to emphasize more meaningful interactions with consumers. And with AI quickly giving us the ability to actually deliver personalized content, we’re that much closer to fulfilling the promise of the right content, at the right time, in the right place. But, there-in lies the challenge: the right content. Technology is not smart enough (at least not yet) to build a piece of content on the fly that fulfills that first objective. So while tools like Marketo, Taboola, and the like can help us deliver content at the right time and in the right place, marketers still have a busy job developing the right content. The definition of which is not what it used to be. In an age where Facebook is saying it wants you to spend LESS time with its news feed (announcing plans to emphasize more meaningful interactions with customers), the status quo in content marketing is no longer about 1 piece of great content and promoting it in every way possible across all audiences. In the this new engagement era, our content needs to work on an individual level. There’s just not enough time in the day (nor room in a marketing budget) to create all that content. What's a marketer to do? 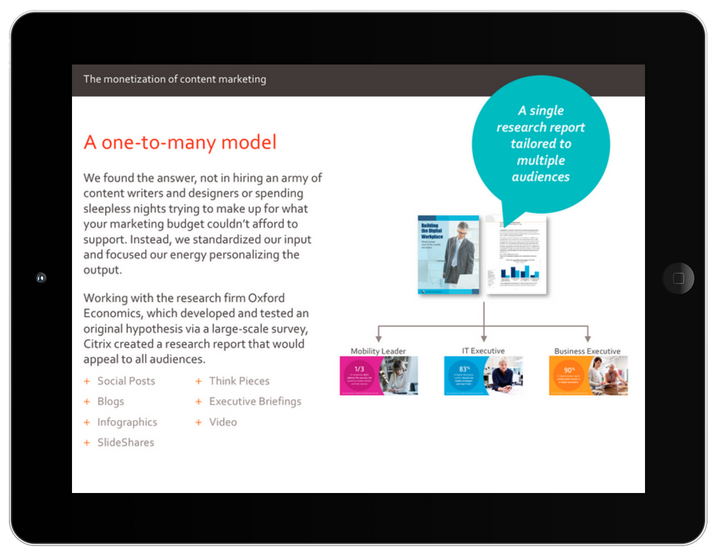 Download our eBook, The Monetization of Content Marketing, for a first-hand look at the strategy that Citrix used to develop the right content for the right audiences, deliver it in a scalable way, and measure its impact all the way through to revenue. If marketers really do their job right in understanding the true needs of their audience, then they can produce great content and use technology to deliver it at exactly the right place and the right time that it matters for an individual customer. This moment of customer serendipity will seem like a pleasant surprise and a welcomed interaction for your audience. And that will naturally turn into success for the business.